Do you have an idea as to how you want your funeral to be carried out by your family? Have you already done some pre-planning? It seems logical to say that in order for your loved ones to carry out your wishes, they need to have access to your information. How can they do that if you are already gone, or your papers are scattered and not kept in an orderly fashion? 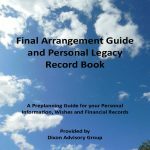 This booklet allows you to compile all of your personal information in one place so it is easily accessible by your family. Names and contact information of all of your family members, emergency contacts, insurance policies, financial records, funeral planning and more are all neatly displayed, so your executor has the information they need to act on your behalf.